I have for a long time wanted to complete a personal challenge activity that would push me both physically and mentally whilst at the same time, raise money for a worthwhile charity. 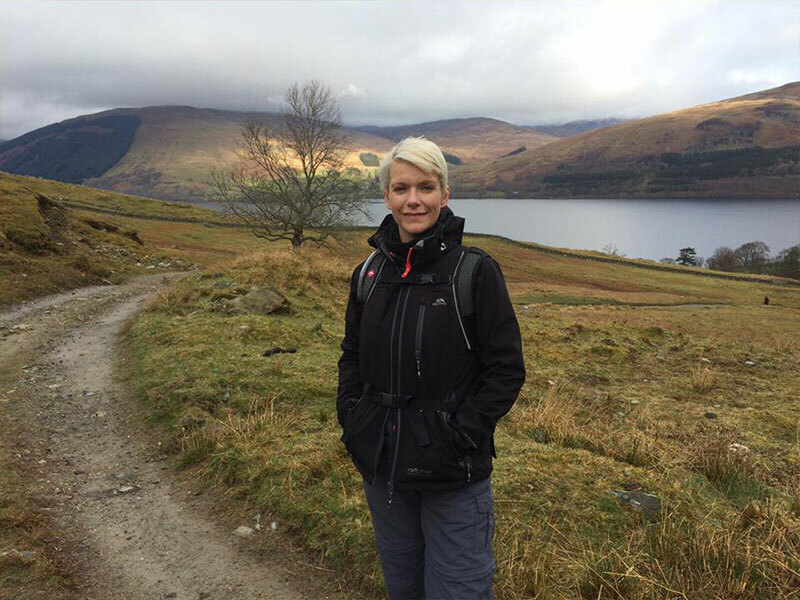 With my 40th birthday looming and after a discussion with a friend who has undertaken many challenges in aid of charity, I decided that I would very much like to climb Mount Kilimanjaro! I am a keen hill walker and love nothing more than to go stomping up and down our very beautiful Scottish hillsides. I love the feeling of adventure I get from being out in the countryside, the feeling of freeness of the open spaces and the beautiful views that change so much throughout the seasons and which never cease to make me feel very lucky that I get to experience them. 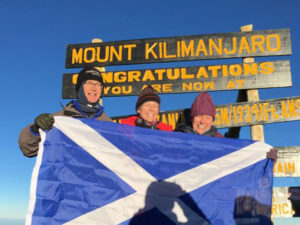 On the 15th September 2017, 24 intrepid explorers flew from the UK to Tanzania with the same goal in every mind: to reach the summit of Mount Kilimanjaro! We arrived into Kilimanjaro airport on the 16th September and were met by our Group leader, Henk and taken by bus to our hotel in the city of Arusha. After checking in, the group met for a briefing given by Henk and the team medic, Dr Mark. It was really motivating listening to Henk talk about the challenge ahead but at the same time, it was very sobering thinking about how difficult this challenge would be. We were all worried about getting altitude sickness and not being able to summit because of it. Henk and Dr Mark were clear – we would all likely feel ill at some point during the trek whether it was a headache, nausea or sickness. The answer – if you get a headache, take a Paracetamol, if you feel sick, be sick – we were to tell them so they could keep an eye on us but they assured us that these symptoms are normal at altitude. We were told that because we were taking 5 days to ascend the mountain (and an overnight to the summit), trekking high and camping low, we would be giving ourselves the best chance to acclimatise and successfully reach Uhuru Point. We were advised that we would be walking very slowly (or Pole, Pole in Swahili) and that we were to try not to move around camps or rush to catch up the group if you need a toilet stop so that we didn’t expend any unnecessary energy that we would need to get through the trek as at altitude, the air is thinner, there is less oxygen and the slightest exertion feels much more than it would be at sea level. Henk talked us through what kit we would need to have with us, what should be taken in our day packs etc. We then had a bit of time to relax before meeting up for our buffet evening meal. This gave us a good chance to meet some of the other members of the group. We all headed off shortly after dinner to have an early night as it was an early start in the morning. Lemosho Glades which is rainforest. It started out quite steeply (which came as a shock to me but doh! Climbing a mountain!!) but evened out in places. We reached our first camp ‘Big Tree Camp’ (9498ft/2895m) after about 2.5 hours which was way ahead of the time it was scheduled to take us – go us! The porters had already gotten the camp set up. Gillian and I ‘bagsied’ tent 3 in ‘the Avenue’. I was quite surprised at how big the tent was – plenty room for the two of us and our massive duffel bags and daypacks. We dumped our bags and set up our sleeping bags as we knew it’d get dark pretty early and didn’t want to set up in the dark. We all met for a cuppa in the mess tent and the lovely cooks had made us fresh popcorn! We all then set off to explore the camp which was pretty busy with quite a few other groups setting up. We had our first experience of camp toilets – Grim! It was a roll up your trousers and pull your neck buff over your nose job we quickly learned. Dinner tonight was cucumber soup (interesting but tasty), spaghetti, cabbage and beef stew. 18th September – up early and packed up our sleeping bags, mats and got everything in our duffel bags and daypacks. Had our Camelbaks and water bottles filled (I hadn’t thought about the additional weight of the water – we needed at least 3 to 4 litres a day to stay hydrated but each litre weighs 1kg! I was certainly keen to get drinking asap just to get rid of some weight!) Felt ok even though my sleep had been pretty broken – probably because I’d had a really early night and even if there wasn’t many z’s, my body had been resting. Hadn’t been cold at all – at this altitude, its not too cold outside yet. I had to adjust my backpack straps as yesterday, even though it was a short walk, I’d found my shoulders to be quite sore. Felt much better for doing this and set off for the day. We walked for just under 6 hours today across the Shira Plateau, coming up and out of the rainforest to a much more open space. Lunch today has to be mentioned – as we were coming up a hill, we came across our porters who had set up for lunch right there – they had set up trestle tables and our chairs and had even put lovely tablecloths over the tables! Lunch was a boiled egg, salad and a sandwich. The sandwich was toasted and had a jam and carrot filling. Yip, jam and carrot!! Strange combo but we were hungry travellers so we ate it! We gained about 2000ft/610m on todays walk and camped at the Shira 1 Camp (11,500ft/3500m). Beautiful, quiet camp where we got amazing views of Kilimanjaro and Kibo. On arrival at camp, the porters and guides treated us to some mountain songs – fab and after a long days walk, I felt quite emotional. I had dinner and a laugh with the others in the mess tent then retired to bed. Tonight was the first night we got an unobstructed view of the stars in the sky – truly magical and I stood for some time with my torch off just watching them in the middle of the night on the way back to the tent from the toilet. Saw a few shooting stars (wonder what my wish was??). It got quite cold tonight and I had to put on an extra fleece. Gets much more difficult to get up for the toilet in the middle of the night when it’s cold!! 19th September – So last night at our evening briefing, the lovely Henk spoke about today being his most favourite day. It was to be a long one but with great views etc. We’d love it he said. Yeah, right – but I suppose he couldn’t really say this was to be the day that would nearly break the majority of us – guess that’s not really motivating!! Today was so challenging. We trekked for 11 hours, mostly uphill. It was the day where we would push our bodies and try to acclimatize to the high altitude. We climbed to an altitude of 4,500m and then descended to camp at 4,000m. There was some beautiful scenery on the way – we trekked to Shira Caldera, a high altitude desert plateau rarely visited by man and the third of the Kilimanjaro volcanic cones and up to the Lava Tower (or ‘sharks tooth’). After a couple of hours walking, I started to feel nauseous and as we ascended higher, this feeling got worse until I was then sick. I felt pretty sorry for myself but there was nothing to do but just keep walking. The lovely Dr Mark shared his M&S Cocktail Jellies with me and this was the only thing I could keep in my tummy. We eventually stopped for lunch near to the top of where we would be ascending to today – I swear, the sight of that mess tent perched up that hill just filled me with terror that day!! I was feeling pretty exhausted by this time as I’d been trekking on nothing in my stomach but the thought of lunch made me feel worse. On the menu was cucumber soup (yep, soup was a daily staple) and deep fried peanut butter toasties! No way I could even look at the toasties so I held my nose and drank the soup. Managed to keep it down (just). We weren’t too far from the 4,500m elevation after lunch then we started our descent to camp which frankly seemed to take forever as we were all really exhausted and many of us were feeling the effects of the altitude – some were sick, some had throbbing headaches and others were struggling to catch breath. I found that as soon as we started going down the mountain, my nausea felt better and I seemed to get back a little energy. 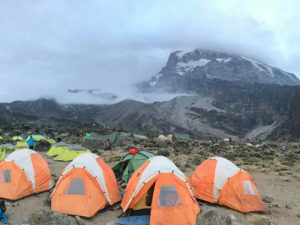 I was still one of the last into Barranco Camp that evening and I remember being so glad to see the tents but could also see the famed Barranco Wall looming to the left. I had absolutely nothing left to give this day and just couldn’t think how on earth I’d be able to climb up that sheer wall tomorrow. I admit to collapsing onto a rock outside our tent as I reached camp and just sobbed my wee heart out. I was just exhausted and emotional (now I think on it, there were lots of times I got quite emotional on this trip – can altitude be blamed for that?!) and so glad to have made it through the day. On one hand, it had been a horrible day as I’d been sick right through it but I had also proven to myself I could work my way through that and I had felt better on the way down. I kind of just knew that if the same happened on summit night, I’d dig in and push through it! Wasn’t sure if I’d manage dinner but I did – not much but enough to see me through the night. I could barely keep my eyes open so another early night. The icing on the top of reaching this camp was that the porters set up 2 toilet tents for us (which was a portable loo in a tent – pure luxury – it’s the little things). I slept soundly all night and woke up feeling energised on the 20th September!! I remember coming out of my tent just as the sun was rising and the view taking my breath away – the way we were set up in camp, it looked like you could just hop off the edge of the mountain onto the clouds below – the pictures are amazing of this but really don’t capture the beauty of it properly. Early start again after breakfast of pancakes, eggs and porridge (totally made up for the day before!) and our daily warm up which seemed to always work as I was never sore after our walks. We set off for the Barranco wall – eek! This has to be one of my absolute favourite days and I’m pretty sure all on the trek would agree. Although I had been daunted by the sight of the wall, I found it exhilarating to be scaling up it. Most of the group just kept saying to each other “this is amazing, I’m loving climbing this! !” What on earth had they put in our porridge this morning!! We then trekked over the alpine desert and arrived about 5 hours later at Karranga Camp (13,450ft/4,100m). We were straight in for dinner and you’ve never heard cheers like this from a bunch of tired trekkers – they had cooked us chicken and chips and made us coleslaw!!!!! There were no leftovers this evening lol! Henk asked us at dinner to each talk about why we were doing this trek and what charity we were raising money for. This became very emotional as people had lots of personal reasons for taking on such a challenge. Everyone has such inspirational stories to tell and excellent charities they are raising money for. After dinner, Henk offered those who wanted to join him on an hours walk up the mountain to further help with the acclimatization process. Most of us did this and actually, it felt ok. I found this evening that although I was really tired, I wasn’t quite able to sleep well. I’d drift off and have a crazy Diamox/altitude dream and then wake up and this cycle continued all night. It’s now really cold at night and the tents are really frosting up overnight. 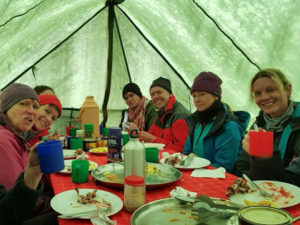 We had rain through the night and those lovely guides and porters (who were off the clock) went round every tent making little paths for the rain to run away from the tents to keep us dry – these guys are truly amazing and look after us so well! 21st September – So we climbed up to our High Camp this evening and this camp sits at 15,090ft/4,600m. It was a pretty hard day going up the Barafu Ridge due to the altitude as there are a lot of rocks to climb over and this knocks you off pace and really takes your breath out of you. We’ve noticed that the slightest movement can be tiring – I’ve found it getting harder each day even to pack my duffel – it’s hard to physically move around and to think of the order things need to be packed in. It wasn’t a particularly long day as we got into the High Camp about an hour or so after lunch and again were met by our porters and guides singing to us. Made me cry …again! We rested up this afternoon as this is the penultimate day. We had an early dinner and had our final briefing from Henk who spoke to us about what to expect from summit night and how to prepare, what to wear etc. We tried to get some sleep – don’t think we did though before getting up at 11pm, had tea and biscuits in the tent and prepared to set off at midnight. Such a scary feeling just before we set off. Will I make it? Will I get sick? I put on layers of clothing as it was freezing. Didn’t have my big jacket on though as I didn’t want to overheat at the beginning of the walk (5 layers on my top half was probably still overkill at the beginning lol!). Its pitch black so we all had our head torches on so all you could see were little blobs of light making their way up the mountain. We had lots of summit guides join the crew tonight – they were checking on us all the time to make sure we were doing ok. My lovely guide was called Adam and he took great care of me all night. He carried my rucksack, warmed up my hands, fetched my water and snacks from my bag and generally just made me laugh and kept my spirits up. I started the walk tonight trying to keep my mind busy. I played rounds of the ABC game, went through my morning routine in real time but then my mind just seemed to blank and I just was trudging along behind Adam, following his footsteps. I just kept going. Every hour, we stopped for a break for a couple of minutes. We couldn’t stay still for long so breaks were kept short.. Coming to the 4th hour was my difficult time – I was just so tired and felt really sleepy. At one point I must’ve closed my eyes as I was walking – I got a torch shone on my face and told “no sleep!!”. It’s apparently really dangerous to fall asleep up here – your blood pressure can fall quickly and you can go into a coma. The guides kept us going by singing mountain songs – it was quite hypnotic. Just before sunrise on the 22nd September we summited Stella Point (18,865ft/5750m). I couldn’t believe we’d got here – I thought we had much longer to go! We were all crying, congratulating and hugging each other and were given hot cups of tea (aren’t these guides amazing for thinking to do that?). We then started making our way to Uhuru point which would take a further hour. 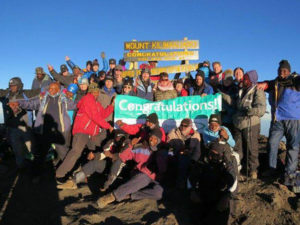 Uhuru is the highest point on Kilimanjaro and is at 19,340ft/5895m! I remember trudging along and the guides saying “look back”. I looked back and the sun rising up just took my breath away! The colours! Purple and orange – just beautiful. We could see the glacier as well which was amazing. 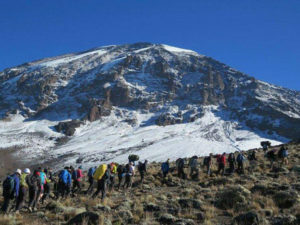 We quickly (well at the pole, pole pace) came within sight of Uhuru peak – breath-taking!! I just couldn’t believe it! We had made it!!!! To see that famous sign that I’ve been dreaming about getting to for over a year and actually be at it was surreal. I felt so proud of myself and for my mountain family for succeeding. In fact, 100% of our group summited and we all summited together which isn’t usual Henk says. We had our pics taken and tried to burn the image of the peak and the glaciers into our minds. Then it was time to go back down to camp. It took six hours to get up and my guide had me down in about an hour and a half!! We scree skied down!! Exhilarating! Not sure where I got the energy from but I was second into camp. I had to drink at least a litre of water before sleeping (Henk’s orders). Did so and then collapsed in the tent. Woke up in a blisteringly hot tent and was sick! Think my body had gone into shock. Couldn’t face lunch. We set off at midday to Mweka Camp which was the last camp of the trek. Going down was really tiring and sore on our joints. It seemed to take forever but we finally reached the camp about 6pm just as it was getting dusky. I found it difficult to eat but had some pasta before collapsing into a blissful nights sleep. It was strange but the descent on such a long day had really taken the shine of summiting. Everyone was so tired. Woke up on the 23rd September after a great night’s sleep and feeling much better. I remember turning to Gillian and saying “my god, we really did it, didn’t we?” I felt so happy. Everyone was in great spirits this morning – great banter at breakfast. We set off for the last time and although we were still going downhill, the terrain wasn’t quite as rugged as we went through the rainforest. We met some local children who we shared our sweeties and water bottles with just before we came into sight of the Mweka Gate, our finishing point. The group all walked through this together – amazing feeling! We finished the walk by having a celebratory lunch at the Gate. Our Guides and porters gathered to perform for us and we gave them the tip money we had collected for them. We had Champagne (and more importantly, bottles of Cola!!!) and chips for lunch (classy lot!) and it was fantastic. I tried calling home as I had a signal and couldn’t believe it when my hubby, Joe answered – my calls hadn’t got through before!! I of course erupted into tears and gave the news that I had made it to the top! It just felt so overwhelming to share this news with Joe. We then all had our boots cleaned before getting into our busses and heading back to the hotel in Arusha. According to my Fitbit we walked 118.81km, took 172,161 steps, climbed 953 flights of stairs and burned over 20,000 calories (it’ll be much more as you burn more calories at altitude). 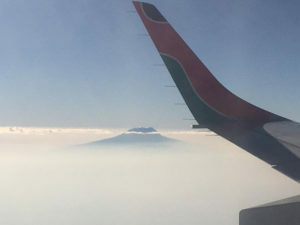 It was such a life changing and amazing experience to have climbed Kili (this is a thing – those who summit Kilimanjaro earn the right to call it Kili!!). There have been highs and lows along the way but it has definitely been worth it. I learned that I’m a much stronger person than I thought I was. I can cope when the going gets tough. I made a great set of new friends who I feel privileged to have shared this challenge with. Our group leader and the Doc looked after us and kept us motivated. Lastly, I’m so thankful for the guides and porters that were with us every step of the way – these people are truly amazing and their fitness levels would put athletes to shame! Thank you Kili for all you’ve given us!